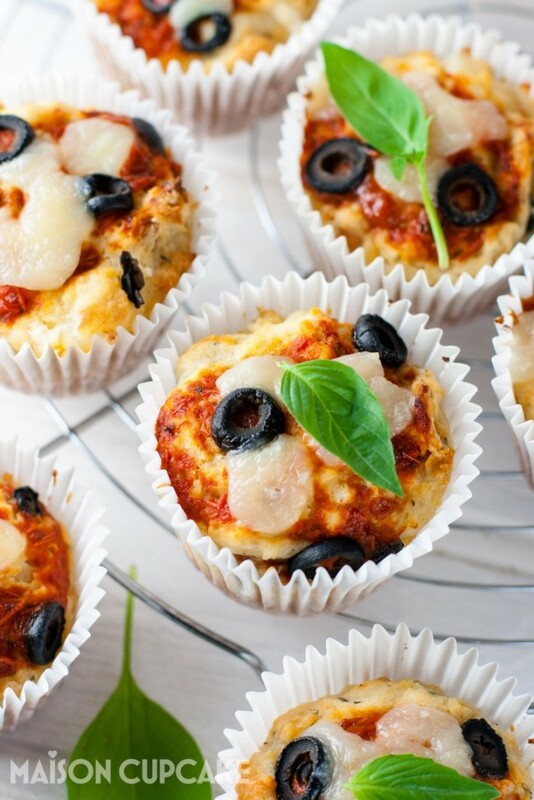 Make these tasty pizza muffins with savoury flavours in under 35 minutes. This is an easy recipe you can bake with kids for snacks or packed lunches. When is a pizza not a pizza? When it’s a muffin! It’s been far too long since I baked any savoury muffin recipes. They’re so quick to make I really don’t know why. I have always preferred eating savoury muffins to sweet muffins and yet this is only the second savoury muffin recipe to appear on this site. I must make some more fast! I’m sure I’m not alone admitting a secret guilty pleasure for eating leftover cold pizza slices. In fact I recently read that because our bodies burn off more energy digesting cold food one might argue that this is better for you than warming it up again. 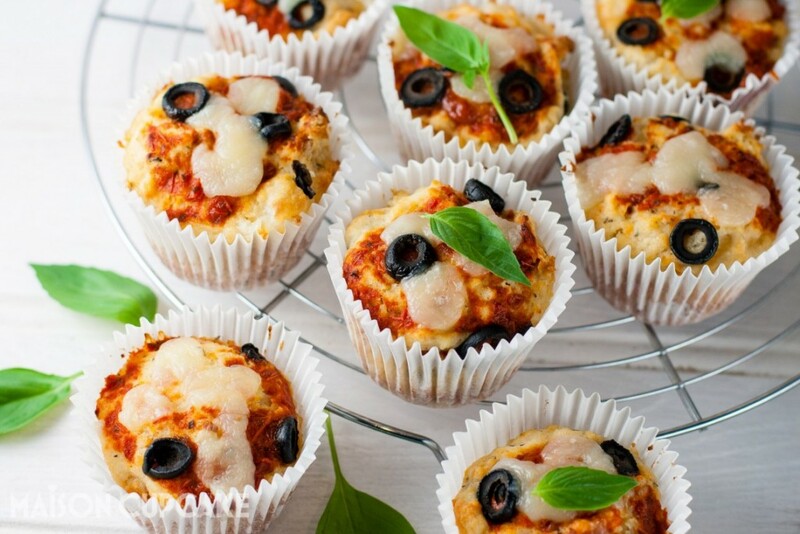 With these pizza muffins you can pretend you are eating cold pizza without needing to apologise for it. 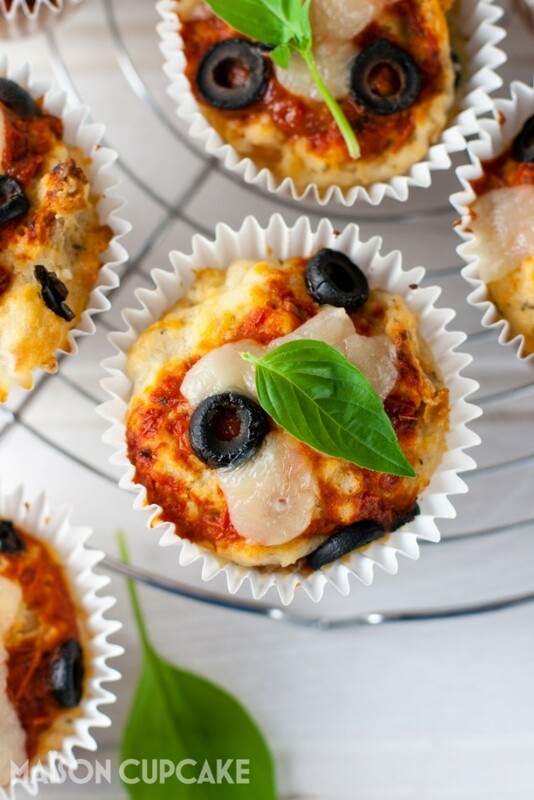 In fact, because these pizza muffins are ready in just over 30 minutes you can use them to get your pizza fix in far less time than making a real pizza. This recipe uses buttermilk but you can substitute with 150g Greek yogurt mixed with 125ml whole or semi skimmed milk. I used bottled pizza sauce for convenience but you can use any non chunky homemade tomato sauce. For further convenience I used ready sliced bottled black olives but you can pit olives of your own choice. Finely chopped fresh thyme would be great here if you have it, if you don’t have dried thyme either than you can substitute with oregano, basil or herbes de Provence. Bits the grown ups need to take over are getting the oven tray in and out of the hot oven, putting the mozzarella onto the hot partially baked muffins and removing the hot muffins from the baking tin. My favourite large white muffin cases* are from Lakeland – they are slightly taller than every other type I’ve bought elsewhere. You can eat the muffins warm from the oven but they stick to the cases less if you let them cool first. This muffin tray* is by Le Creuset and the most solid I’ve found. My round cooling rack* was from Dille e Kamille in Belgium but Amazon sell similar by Faringdon for £3.50 (at time of writing). 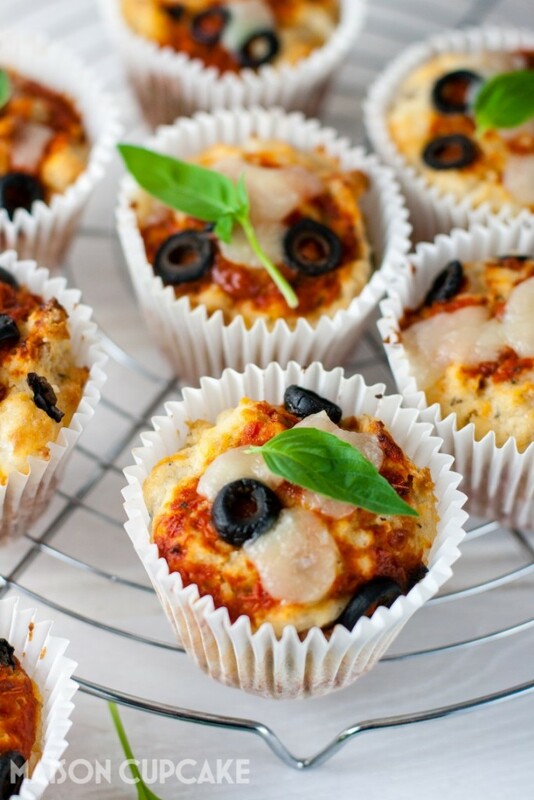 Tasty savoury muffins with pizza flavours that you can make in under 35 minutes. Easy recipe you can bake with kids. Preheat the oven to gas mark 6. In a large mixing bowl combine the dry ingredients; flour, baking powder, bicarbonate of soda, salt, thyme. Chop the sun blush tomatoes and mozzarella cheese into 10mm pieces. Set one third of the mozzarella pieces and one quarter of the black olives aside. Add the chopped sun blush tomatoes, sliced black olives and two thirds of the mozzarella to the dry ingredients. Stir gently with a metal spoon until all chopped ingredients are incorporated and individually coated with the flour mix. In a medium size bowl, melt the butter in the microwave and let it cool slightly. Beat in the buttermilk and egg until smooth. Pour the wet ingredients over the dry and stir with a metal spoon until just combined. Do not over mix. Spoon the batter into the muffin cases. 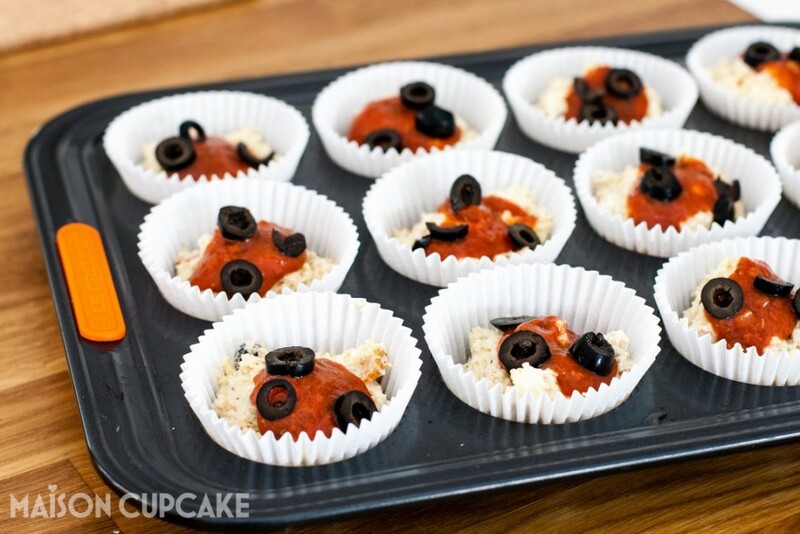 Then spoon a little bottled pizza sauce over each muffin, scatter with some olive slices and bake for 14 minutes. After this cooking time, remove the muffins from the oven and quickly top each one with a few of the remaining mozzarella pieces. Return to the oven for a further 4-6 minutes. Cool the muffins in the tin for a few minutes before placing on a wire rack to cool completely. 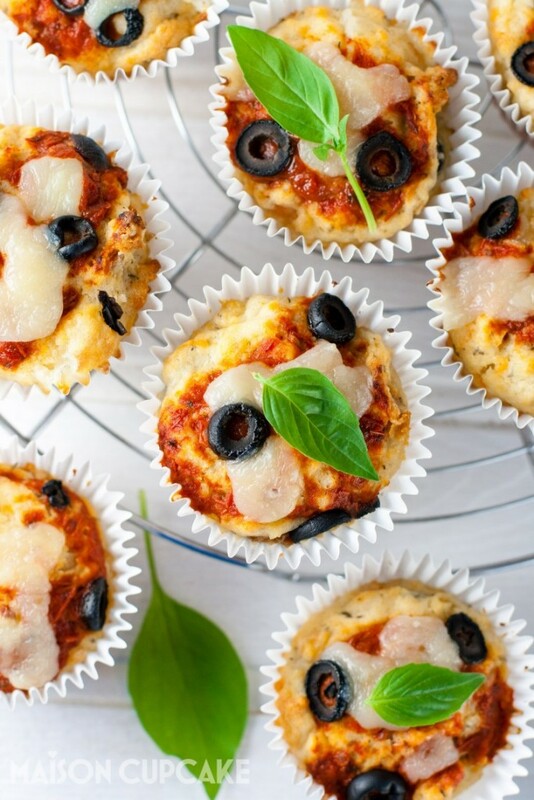 *Affiliate links used in this pizza muffins recipe post. What a fabulous recipe Sarah. I am eyeing these up for breakfast. I love the look of these – such a great idea. I’m the same as you…I almost prefer cold pizza to hot so I can see these becoming a firm favourite!